The tablet computer hasn’t been around long at all. But it’s making a huge splash in the digital arena … and giving not only laptops but also smartphones a run for their money in the bargain. Tablet adoption is happening significantly faster than what was experienced with smartphones. The majority of iPad users don’t own an iPhone or some other type of smartphone. Tablet “early adopters” are equally male and female – a departure from the norm which typically finds early adopters of new digital technology being primarily young men. 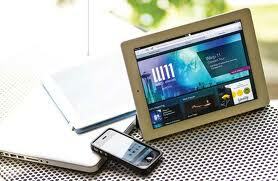 There is very high usage of tablets for shopping, watching video, and other media consumption. That’s also a departure from what was experienced with smartphones, where it took much longer for consumers to become comfortable shopping from their smartphone devices. People use tablets and smartphones differently – and at different times. For example, smartphone usage peaks during the day whereas tablets are used more in the evening. That tablets are making big gains on laptop computers is no surprise at all, considering their lighter weight, nearly effortless portability, brighter screens, and the ease of using them in environments not conducive to a keyboard-and-mouse (like in bed). But of the trends noted above, I think the most intriguing one pertains to tablet computer usage versus smartphones – specifically, how tablets are becoming an alternative to smartphones rather than an adjunct. Indeed, it seems as if some people aren’t making the transition from feature phones to smartphones that everyone expected; they’re opting for tablets instead. We may see the adoption rates for smartphonesbegin to flatten out as a result. Indeed, Adobe Systems reported in May 2012 that tablet traffic is growing at a rate ten times faster than smartphone traffic. But if you really think about it, maybe these latest developments aren’t so surprising: Many folks have long complained about the “miniaturization” of display screens that are a necessary evil of mobile phones. Now that the tablet has come along, there’s finally an effective solution to that dilemma – and the market has responded accordingly, blowing away even the most optimistic sales forecasts for tablets.